On the surface, there's little that connects software-as-a-service-company Appian Corporation (NASDAQ:APPN), marijuana grower and seller Green Thumb Industries Inc. (NASDAQOTH:GTBIF), and uranium miner Cameco Corporation (NYSE:CCJ). Except that some of the world's best investors have stepped in to buy their stocks. That makes now a very good time to get to know this trio of companies, before the rest of Wall Street catches up to the smart money. Brian Stoffel (Appian Corporation): Abdiel Capital isn't a household name. The investment firm was founded by Colin Moran in 2006 after stints at Goldman Sachs and Chieftain Capital. Over the past year, the fund has returned 82% for its investors -- far outpacing the S&P 500's return of 18% over the same time frame. The concentrated portfolio is principally invested in small SaaS companies, and it has made a big bet in Appian. After adding slightly to its position during the second quarter, Moran's firm now owns over 23% of shares outstanding. It's not difficult to see the appeal: Appian aims to cut the time it takes to develop a custom app by 50% every two years. Since developing a custom app requires a small army of IT professionals if done in-house, Appian's low-code subscription service is a lifeline to small- and medium- (as well as a few large-) sized businesses. Between 2014 and 2017, subscription revenue grew at a compounded rate of 35% per year. That revenue has a gross margin approaching 90%, showing just how profitable Appian can be once it reaches its full scale. Keith Speights (Green Thumb Industries Inc.): Leon Cooperman is a billionaire investor who runs Omega Advisors. The hedge fund's holdings include lots of healthcare and technology stocks. But Cooperman recently stated that he's putting some of his personal money in a perhaps surprising choice: Green Thumb Industries, a marijuana stock you might not have even heard of. Why Green Thumb? Its growth potential. While most investors have focused on Canada as the country opened its recreational marijuana market recently, the real money being made is in the U.S., where marijuana sales will total $22 billion by 2022, according to the Marijuana Business Factbook. That's more than triple the current market size. Green Thumb currently operates cannabis production facilities and retail dispensaries in eight states: Illinois, Maryland, Massachusetts, Nevada, Ohio, Pennsylvania, Florida, and New York. Florida is projected to claim the third-biggest marijuana market in the U.S. by 2022. Massachusetts is estimated to rank sixth. But Green Thumb isn't limiting itself only to these eight states. The company has applied for licenses or plans to do so in other states as well. Marijuana remains illegal at the federal level in the U.S., which certainly poses a significant risk for Green Thumb. However, Cooperman obviously didn't see this as a serious enough concern to hold off on buying the stock. He didn't become a billionaire without taking risks. Is this the inflection point? Reuben Gregg Brewer (Cameco Corporation): Uranium prices hit a peak of roughly $72.50 per pound in early 2011. Today they stand at about $27.50 a pound. That's been really bad news for uranium miner Cameco. Although it managed to remain profitable through the early stages of the downturn, red ink started flowing in 2016. The downturn led management to curtail production and trim the dividend. That said, it has lost money in 7 of the last 10 quarters despite the aggressive actions taken to stabilize results. So why did Bridgewater Associates, run by hedge fund icon Ray Dalio, buy shares in the company? Although it's just a small position, Dalio's fund is dipping its toes into a very compelling long-term story. For starters, uranium prices are actually up from their November 2017 low of $18 per pound. That's a huge advance, but there's more to this story than a few months of gains. Uranium is used to fuel nuclear reactors. Although nuclear power has a bad name in developed countries, developing nations continue to build new nuclear plants. There are 57 plants under construction today, with more likely on the horizon because of rapidly increasing demand for electricity in emerging markets. Meanwhile, low uranium prices have led to a falloff in spending on new mines and, thanks to curtailments, a decline in current supply. Industry watchers expect demand to catch up to supply in the next few years. 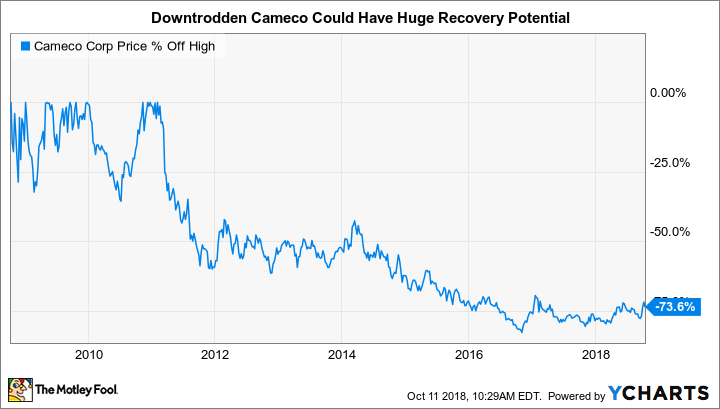 If that happens, uranium prices would likely continue to rise -- which would be great for Cameco's business.